My friend Dani is one of my closest and most thoughtful friends. We shared the same major in college and met in a Photoshop class. We became fast friends and have been inseparable since. We've haven't lived in the same city since we graduated but always have our roots in Athens, a small, southeastern Ohio town that we essentially grew up in. (OU! OH YEAH!) If you meet anyone who went to Ohio University, I bet they will have nothing but amazing things to say about this magical town and I have countless fond memories. I feel an instant connection with anyone I meet that is an alum as we trade stories and reminisce. Two year ago, I received these coasters as a Christmas gift from Dani. I absolutely love them! I think these custom coasters are a great idea because they're useful, the quality is fantastic and I love that you can add a personal touch. I use them daily and, every time I do, I think about my friendship with Dani, where and how we met and how much love I have for my college. Dani went above and beyond and gifted several sets of these for Christmas. I love that she did and I can't help but smile when thinking about so many of us across the U.S., drinking our coffee, having friends over and using these coasters every day. Below are a few pics from Dana, Sam and Anna, who kindly sent me photos of the coasters in action! I asked Dani to share some words about how she came up with the idea for this gift that keeps on giving. When I moved from Asbury Park, NJ to Hoboken, NJ my friend Dana Stewart gifted me a pair of the coasters from Carla Gizzi, a shop in New Jersey, one for Asbury Park and one for Hoboken. It was so sweet and thoughtful; I loved having where I've been and where I am side-by-side. I began building on the collection by purchasing a coaster for Jersey City when my boyfriend, Harrison and I moved in together there after Hoboken and then New York City and Lavallette, NJ – two other places with significance to me. 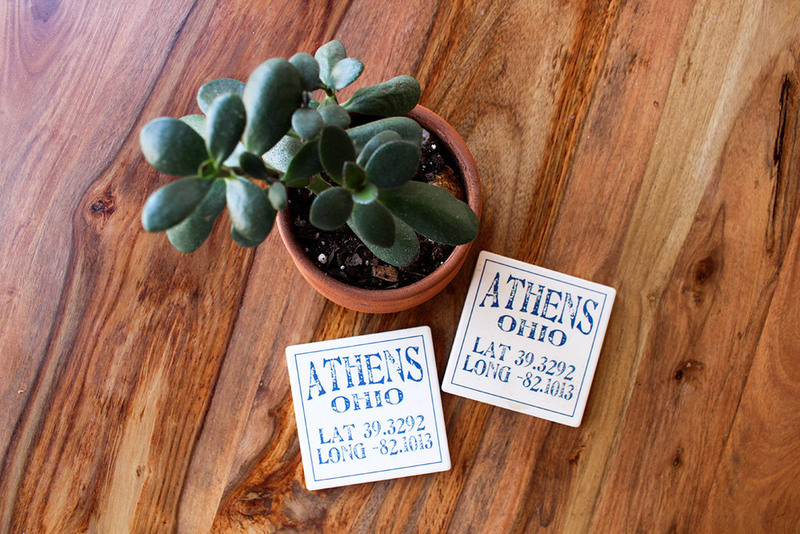 I realized that most of the coasters were meaningful to me and not to Harrison, so I looked into custom ordering Athens, Ohio and Charlestown, RI (where we went to college and where he spends his summers) coasters as Christmas gifts. Instead of being deterred when I found out that an order of a dozen is the minimum for custom orders, I took it as an opportunity to spread the love! 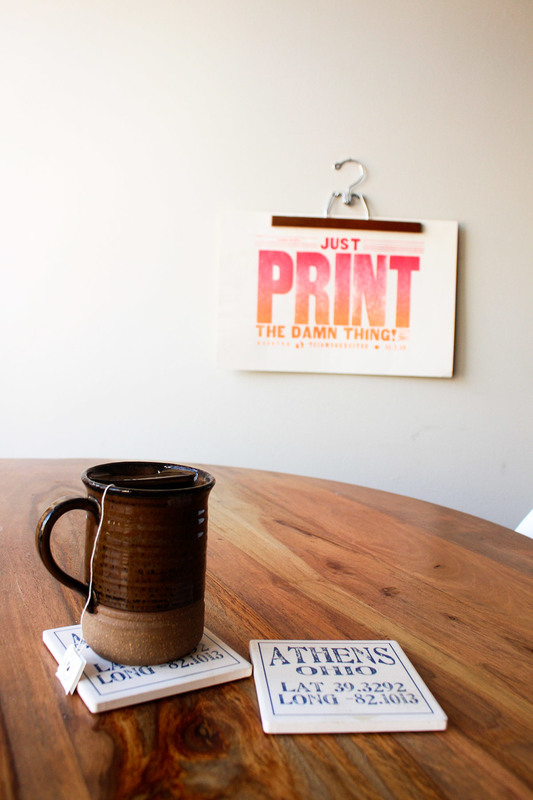 I ordered a dozen for each location and gifted the Athens coasters to fellow OU Alum and gifted some of the Charlestown coasters to Harrison's parents and the rest to Harrison's extended family grab bag. Have you used this idea before or would you use it again? • "(Fill in Location) misses you!" • "Yay, you just moved to town!" Where did you buy these? How did you decide? Carla Gizzi is an independent shop with two locations, both in NJ. She orders them from a vendor that I may have been able to reach out to directly but I love shopping local!